← 5th London Cabaret Awards to be voted for by public! 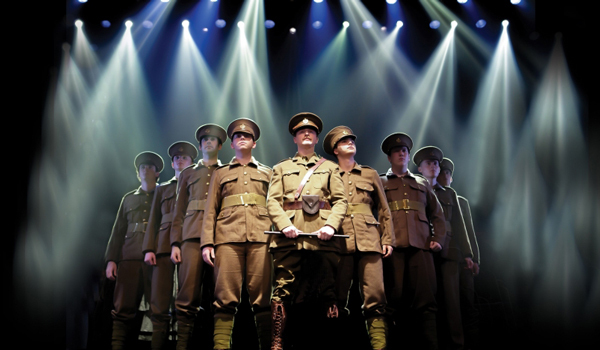 The Dreamers, the new original World War One musical currently running in the main house at St James Theatre was written and performed by a couple of young composer/musicians, James Beeny and Gina Georgio, and a community theatre group in Tunbridge Wells comprising mainly young people. Writing a commemorative song for their band The Virgin Soldiers, Beeny and Georgio’s research led them to a local hero Reggie Salomons, who led a battalion to Gallipoli and made the ultimate sacrifice for his men. He was 19 years old. Gradually, a whole theatre piece developed from the song. The band and choir performed the anthem at a charity event held in Australia House, where actress Amanda Redmond was present. Moved by their music and interest in the subject, she offered support. A draft of the current piece was performed in Tunbridge Wells, where some London producers were present, and now the fully fledged costumed piece can be seen at St James. I will admit that initially I braced myself for over-sentimentality. What I saw was genuinely moving, and an original and unusual take on the subject. The present-day dressed musicians, playing both classical stringed instruments with electric guitars and keyboards, are placed in front of a screen showing films from the time and pre-recorded narration from Amanda Redman, Tim Rice and familiar BBC broadcasters, giving comment as the contemporary Cabinet. The costumed drama is played out in front of them, making full use of the apron stage. No attempt is made to deny that this is a modern-day response to the War, with modern music and sound, giving it a historical distance through which to the view the action. It was apparent the cast are not professional, but rather than diminishing the production, the naivety of the young people playing the soldiers and women added to its poignancy, reminding one of the innocence of many of the real Great War soldiers. There were also some very good children in the cast. Although this is more of a narrated story with music and song, than a crafted musical with a plot and character development, tending to give a feel of ‘history for schools’ documentary, it is the sheer heartfelt passion and commitment of everyone involved that is palpable and thrilling. They were singing for this “ancient land” with unabashed patriotism, without losing any sense of humanity, and their pride in the piece they created is justified. The production is by no means perfect, but the passion of those involved make this one of the best community pieces I have seen. This entry was posted in Theatre Reviews and tagged fiona jane weston, James Beeny, The Dreamers, World War One. Bookmark the permalink.